Alfred Hitchcock may have been a genius, but he was certainly a nasty piece of work when it came to women actors, especially those who spurned his sometimes clumsy advances or let him down in some way. Some have noted that his films became increasingly violent towards woman after Psycho (1960), around the time he built up a stew of resentment towards actresses such as Kim Novak, Audrey Hepburn and Vera Miles. The latter -- whom he had seen in a television production in 1955 and was immediately smitten by -- went on to appear in some episodes of his own television series Alfred Hitchcock Presents, but she let him down when she got pregnant while under contract to him. For him she had broken the momentum of her career, and he disliked that. In fact it was partly because of Miles that Hitchcock started his career on the small screen. Around that time -- under considerable urging from his agent Lew Wasserman who argued the director could get to an audience much greater than his features -- Hitch was looking for a project to get Miles into. Once the television contract had been signed Hitchcock immediately secured Miles and contracted the stunning 26-year old to a three-picture, five year agreement . . . and her first film role was alongside Henry Fonda as a woman who suffers a nervous beakdown. 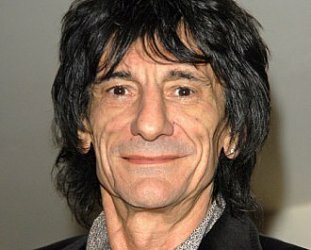 It was a part however she would first play in his inaugural television production Revenge (which was the second he filmed but broadcast first). 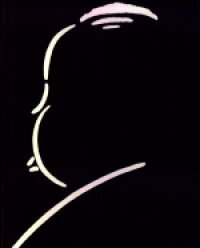 Hitchcock had a very sweet deal for the television series which ran for years: He would simply do the intro and outro in his typically droll manner (appearing before a caricature of himself that he drew) but could pick up the option of directing some episodes. 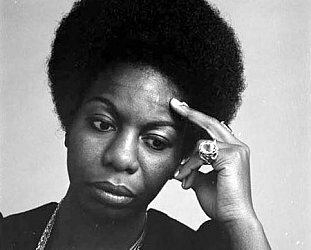 With Miles in Revenge he could indulge himself as the camera pulled in close on her as a sensual newlywed who has suffered a breakdown -- conveniently she was a dancer so his camera lingers on her legs -- and then has a mental collapse. The twist is that she identifies a man who had molested her when she was at home alone ("That's the man, there he is") and her husband takes the law into his own hands. Later as they are driving she again says, "That's the man, there he is" and points to another stranger on the street. As a first episode in the half hour series it was a canny dive into the world of madness, a theme which Hitchcock liked and would rework constantly throughout his career. 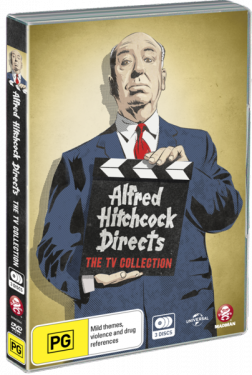 The three DVD set Alfred Hitchcock Directs pulls together crisp prints of the 19 of the episodes he helmed* and they make for amusing and sometimes gripping viewing. He also experimented with style as in Incident at a Corner in '60 with Miles and George Peppard which, in its Rashomon-like opening sequence, looks at the same small incident from a number of different viewpoints. Initially the series were half hour black'n'white episodes (the first screening in September '55) but eventually they were expanded to hour-long mini-features in colour. Aside from the chilling stories and seeing Cailfornia in the Fifties (wide empty streets, cool cars etc) there's some amusement to be had in seeing actors who went on to other things: a young Aunt Bea from The Andy Griffith Show and the guy who played the banker in The Beverley Hillbillies, and big names like Arthur Cotten, Ray Teal, Sir Cedrick Hardwicke, Vincent Price, Barbara Bell Geddes, E.G. Marshall, Keenan Wynn, Laurence Harvey, John Forsythe . . .
Everyone wanted to work with HItch. And the stories came from the likes of John Collier, Raold Dahl and Henry Cecil. 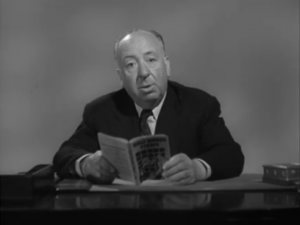 What is also pretty funny is how Hitchcock is so dismissive of the show's sponsors ("The tradition is that the sponsor must be coddled," he said, "In such an atmosphere I was a novelty") and the crackingly droll little scripts he was given by James B. Allardice which reeked of the macabre and the acerbic. Alfred Hitchcock Directs is a coolly diverting collection, and the show's theme music was Gounoud's Funeral March of a Marionette. * Oddly enough Four O'Clock from 1957 written by Cornell Woolrich who wrote the script for Lifeboat isn't included, perhaps because it was scheduled for NBC. It is below for your amusement. 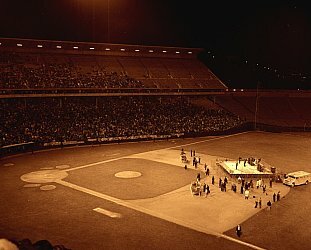 THE BEATLES; THE TOURING YEARS (2016): So you still wanna be a rock'n'roll star?